Periodontal disease (gum disease) is progressive, that is, if it doesn’t stabilize or show signs of healing, it’s bound to get worse. Even when it doesn’t hurt, untreated gum disease will eventually result in tooth loss. The course of gum disease proceeds in spurts of activity over time. In the early stage – gingivitis – we find the gums inflamed or swollen. But the bone is still in good shape. As bacteria and plaque migrate deeper in between the teeth and gums, the condition is on its way to early or moderate periodontitis. 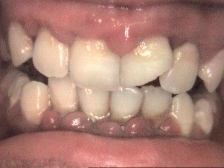 Gum inflammation extends to the bone beneath, which begins to erode. In severe cases, we’re racing with the clock. Teeth begin to loosen and move. At this point, without surgical intervention, the only alternative is removal of the infected teeth. If you have noticed any of these symptoms, simply call our Lemont dental office and Dr. Mohajir will help you with your gum problems. 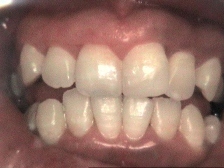 Below, you will see results from actual patients of Lemont dentist Dr. Mohajir. The initial treatment method is called scaling and root planing. You may have heard this called a deep cleaning. Scaling and root planing is something like a routine cleaning. But we reach further beneath the gumline to clear away the toxins causing inflammation. Under local anesthetic, we remove plaque and calculus (tartar) deposits, then smooth the root surface of each tooth to encourage re-attachment of the gum tissue. These simple procedures go a long way to eliminate the source of gum problems. Deeper pockets may require additional surgical care to thoroughly clean away infected tissue and repair the damaged jawbone. After that, it’s your turn. We’ll take time with you to explain how to maintain tissue health at home. Home care – more than anything else – is the key to successful periodontal therapy. Call us today to request an appointment and prevent further gum disease development.